Forskohlin : 1. It increases the amount of cyclic AMP (adenosine monophosphate) in cells by activating adenylate cyclase enzyme. 2. It inhibits mast cell degranulation and release of histamine and other allergic compounds. 3. It increases insulin secretion and thyroid functioning. 4. It inhibits platelet activation and degranulation. 5. It increases lipolysis of fats. 6. It shows transmembrane signaling which results in activation of other cellular enzymes. 7. It shows inhibition of pro-inflammatory substance known as platelet activating factor (PAF) 6. Curing Diseases : 1. It is helpful in hypertension and heart failure. 2. It is useful in eczema and psoriasis. 3. 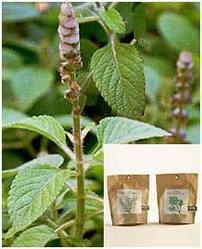 It is useful in asthma, colic and painful urination. 4. It is helpful in insomnia and convulsions. 5. It is helpful in digestion and malabsorbtion disorders. 6. It provides relaxation to arteries and smooth muscles. 7. It is also helpful to obese patients to loose body fat.